Langley Used Car Dealer Gets The Messiest Trade In EVER! You are here: Home / Automobile Deals-News-Reviews / Langley Used Car Dealer Gets The Messiest Trade In EVER! Yes, indeed our Langley/Surrey car dealership accepts ALL types of trades, even trades like this one! BC Autos CAR BUYERS TIP: When you buy(or sell) a used car, you need to keep it a little cleaner than this if you want to get top $ for your trade-in, OK? Read down this post for some useful tips on keeping your car clean! 1. McDonald’s’ daily customer traffic (62 million) is more than the population of Great Britain. 2. McDonald’s sells more than 75 hamburgers every second. 3. McDonald’s feeds 68 million people per day, that’s about 1 percent of the world’s population. 4. McDonald’s’ $27 billion in revenue makes it the 90th-largest economy in the world. 5. The $8.7 billion in revenue from franchise stores alone, makes McDonald’s richer than Mongolia. 6. McDonald’s hires around 1 million workers in the US every year. This estimate from Fast Food Nation assumes a 700,000 domestic workforce with 150% turnover rate. 7. McDonald’s has 761,000 employees worldwide, that’s more than the population of Luxembourg. 8. According to company estimates, one in every eight American workers has been employed by McDonald’s. 9. Sharon Stone worked at McDonald’s before she was famous. So did Shania Twain, Jay Leno, Rachel McAdams and Pink. 10. McDonald’s is the world’s largest distributor of toys, with one included in 20 percent of all sales. 11. For the next three years, McDonald’s is going to open one restaurant every day in China. 12. The only place in the lower 48 that is more than 100 miles from a McDonald’s is a barren plain in South Dakota. 13. Americans alone consume one billion pounds of beef at McDonald’s in a year – five and a half million head of cattle. If You Buy A Used Car Truck SUV or Van From Our Langley Car Dealership, Here’s Some Tips On Keeping Your Investment Clean. It was week one at the new job, and my co-worker needed a ride home. Instantly, emergency lights began to flash in my head. Luckily for me, it wasn’t the onset of exploding head syndrome. It was the impending judgement that I am a messy human being. Evidence: overlapping McDonald’s bags in the back. Or the layer of dust on the dashboard. Or the pile of paperwork on the passenger side floor. Or the coins being held together by Coca-Cola in your cupholder. Or the loose Britney Spears CDs in the console…Last but not least, there’s always a pair of tangled up earbuds sitting in the car. You get the idea. Thankfully, keeping your car from getting too messy has been broken down pretty thoroughly in a recentLifehacker article. So without further ado, here are the five best tips for keeping your car clean (with our own spin on it). Maybe you aren’t all that messy. All you have is a case of clutter-car. Organization is directly correlated to how much road rage you have. The bottom line – organization is easy and prevents unnecessary finger gestures. Cars become mobile homes and offices after a while. They just get messier a lot quicker, it seems. Loose CDs belong in a cheap, mirror organizer. That way, you’re limited in how much clutter you create. You end up keeping CDs that you listen to regularly in the mirror organizer and leaving the rest at home (and believe it or not, CDs are still heavily in use…give one a listen sometime). The cup holders and console area always seems to get out of hand quickly. After a quick trip into the jungle of Amazon.com, this cup holder organizer really stood out. For cell phones, always keep a bottle of ScreenDr readily available. You know you’re going to drop your phone on the floor. You’re going to get food grease on it when you inevitably go through the drive through again for a waffle taco (no one is judging you). ScreenDr is perfect for safely wiping your device at a moment’s notice. And remember the coffee filter tip for wiping the dashboard? ScreenDr can be applied to any surface in your car as well. It contains no alcohol or ammonia, so it is very practical for being on the road. ScreenDr can safely clean your stereo interface, rearview mirror, and driving glasses as well. Keep a small file folder or coupon organizer in your glove compartment for registration and insurance (or use one of these). And any wires for chargers and/or audio adaptors can appear less cluttered with a zip tie or rubber band. As for those pesky tangled earphones, consider using a Nest earbud storage case to avoid a tangled mess when you’re back on the road. Once you’ve overcome the sentimental feelings for trash, aggressively remove everything from your car. One garbage bag for trash, and one for items you’ll keep later. 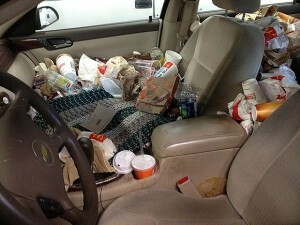 The point is, you want to de-clutter your vehicle so you can tackle where to begin cleaning. The fun really begins when you start cleaning (said no one, ever). If you’re into cheap lifehacks, you can use a coffee filter to wipe down your dashboard dust. The absorbent filter actually does a pretty great job of picking up dirt. If you’re looking to add a fresh shine in addition to a clean look, it’s been suggested that you add a few drops of vegetable oil on the filter as well. However, vegetable oil is always better when left in the kitchen. Leather-specific wipes or an alcohol free solution like ScreenDr can get things clean in no time. When it comes to seats and the carpeting in the car, a vacuum attachment will send those peanuts from last summer’s camping trip in. The best system is going to include a small trashbag and a small container (old cereal dispenser, perhaps?). Whenever you stop to fill up your gas tank, empty the trash bag as well. Not a fan of the cereal container? Just use ziploc bags. What’s common sense to one person is like discovering fire for the first time for someone else. If you can make trash removal as routine as buying gas, your car will stay clean a lot easier. Don’t leave your car without bringing an unneeded item with you. This means bringing the morning’s coffee cup inside when you return home. If you’re a musician, don’t leave instruments in the trunk. No reason to leave paperwork from the bank in the passenger seat, either. This rule can also be applied to any room in your house: always take an item with you when you leave a room. Your sanity will prevail, and suddenly those trips in the car become way less stressful.